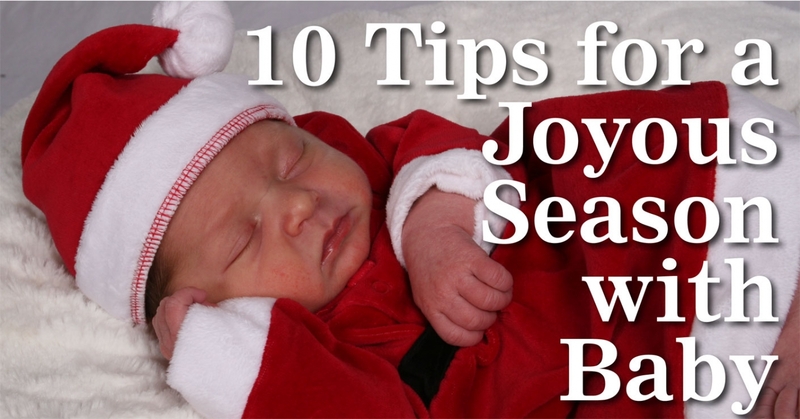 10 tips for a joyous season with baby. Although they can be a source of great happiness, the holidays can also be hectic, stressful, emotionally charged, and overwhelming. Under normal circumstance, there's a lot of pressure to decorate, socialize, host family and friends, buy the perfect gifts, and so (so!) much more. Add a new baby into the mix, and the once-exciting season can seem like yet another hurdle to navigate as you try to adjust to parenthood. It may seem like everyone else around you is having a great time, and they expect you to feel the same way. After all, you have a brand-new bundle of joy in your life! But it's totally normal to feel stressed. On top of the usual December pressures, you have a surge of hormones (for mom), intense emotions, frustrations, new responsibilities, and sleep deprivation. Even with your overwhelming love for Baby, all of this chaos can lead to a bout of the holiday blues,. The following tips may help you enjoy the weeks ahead without burning out or breaking down. First, it's important to acknowledge that feeling tired, overwhelmed, emotional, and less-than-festive is normal. There's no need to feel guilty if getting one more load of laundry done before your baby wakes up (or before you crash) is more important right now than preparing the perfect hors d'oeuvres for the upcoming family potluck. However, it's important for all new moms to be aware of postpartum depression. If you feel altogether detached and uninterested in the holidays, if you notice a big change in your attitude from last year, or if you feel persistently sad and/or angry, you may be experiencing something more serious. Don't hesitate to talk to your doctor about any concerns. 2) Make a (reasonable) to-do list. Being prepared to navigate the holidays is half the battle. When you have a plan in place, the moments of frustration and sadness will be less likely to derail you. Make a list of the things you want to accomplish throughout the next few weeks, whether they're attending certain events, putting up your favorite decorations, or hosting friends and family. Make your list reasonable, and choose six things to accomplish at most. You can always add on more tasks as you go if you feel up to it. Keep in mind that now is not the time to list big projects or cleaning tasks. Wait until after the new year to finally clean out your closet or scrub the baseboards. Having the most important priorities listed in writing will help you to feel more in control, especially during those instances when it's tough to focus on anything other than soothing the crying baby in your arms. Even without a baby, it's practically inevitable that you'll forget to pick up a present for someone, need an item for a last-minute holiday exchange, or have to scrounge up a hostess gift. Save yourself some hassle, and buy spare generic presents in bulk. For example, you can grab case of wine while you're out picking up the economy-size box of diapers. Or buy some gift cards to a popular coffee shop while you're (most likely) grabbing a caffeine fix to help you power through errands. Keeping "just-in-case" gifts on hand will give you peace of mind. If you don't end up using them, just save them for birthdays, anniversaries, etc. in the new year ahead! In other words, let yourself off the hook. Remember, you are not Martha Stewart, and no one's holiday actually looks like a real-life Pinterest board. You don't have to display every single decoration you own. Your house does not have to be magazine-photo worthy. You do not have to bake cookies or have the best dress at a holiday party. It's okay if everyone on your list gets gift cards this year. Most importantly, it's fine if you're a little more frazzled than usual, and it's perfectly acceptable to focus more on making it through the day rather than celebrating the season. Don't set crazy expectations for yourself. As a new parent, your most important responsibility is taking care of yourself and your baby. If some (or all) of those things on your to-do list don't happen, it's okay. The holidays will go on. Give yourself a pass to be more emotional and less social if need be. You just had a baby! 5) Say, "No," to something. Depending on your personality type, cutting back on your holiday celebrations may come as a welcome relief. On the other hand, the thought of not following through with your typical plans may cause you to fight back panic! If the latter sounds familiar, don't worry; no one is going to force you to stay home. Still, you need to make concessions to the fact that your life is fundamentally different. The one thing you can be sure of is that with an infant, lots of things won't go according to plan. You probably won't be able to consistently predict your own moods and preferences right now, either. So even if you're a social butterfly, give yourself some wiggle room by choosing just one major thing to cut this year. Maybe skip sending out holiday cards or hosting dinner. Taking even one thing off of your plate can help to relieve stress and anxiety. Shopping local can be wonderful for the businesses you love, but being out and about with an infant is no easy task. In December, you're already up against large crowds and bracing cold temperatures. Now, you're additionally worried about your new baby's needs. Plus, dirty diapers and tantrums tend to happen at the most inopportune times. Avoid situations that may trigger anxiety by purchasing gifts you can have delivered right to your doorstep. When you are feeling vulnerable or overly emotional, it's all too easy to turn to unhealthy coping mechanisms. Overeating and overspending are two very common culprits, and the holidays are full of opportunities for going overboard on both. Don't give yourself a guilt trip if you happen to slip up, however. Just be honest with yourself about how you're likely to handle extra stress and uncertainty. If you know that holiday treats or sales will be a temptation, be extra wary. 8) Know your triggers and designate a go-to supporter. We all have triggers that make us angry or upset. A lot of those triggers are present during the holidays: your impossible-to-please mother-in-law, the brother with whom you've never really gotten along, the social unease you feel at big events, and much more. Since it's normal for your emotions and anxieties to be magnified after having a baby, it's important to identify these triggers beforehand so that you can avoid as much stress as possible. Eliminate whatever triggers as you can, and for the ones you can't eliminate, such as a disagreeable relative, have a strategy ready to nip trouble in the bud. You might say, "I know you disagree with some of my parenting methods, Aunt Edna, but my husband and I are doing what is best for our family. Let's talk about something more pleasant." No matter the situation, remember: You can use the fact that you're a new parent with an infant as an out — after all, it's true! Your well-being, as well as that of your child, should be your top priorities. Lastly, set up a support system before the holidays are in full tilt. Have someone with whom you can chat when you start to feel overwhelmed. Whether you send your partner out to do the holiday shopping, hire a babysitter so you can catch up on errands, or invest in a house-cleaning service, give yourself the gift of help. The bottom line is that you have a lot to do. Chances are, you have some family and friends who would love to help. As long as you stay within your budget, trading some money for extra time or saved sanity is a great investment. Commercial hype does its best to make us forget this fact, but the truth is, the best part of the holidays is the chance to focus on loved ones. If you're a new parent, you have lots to celebrate on that front. Make sure all the other stuff — presents, decorations, parties — that comes with the holidays doesn't become first priority. Set aside time to be with your family. Focusing on what really matters this year will give you peace and help you to tap into that joy you're looking for. Above all, stay in tune with your mental and physical needs, as well as those of your baby, and don't be afraid to make whatever changes are necessary to keep both of you healthy and happy. Princess Ivana Pignatelli Aragona Cortes is the co-author of A Simple Guide to Pregnancy & Baby’s First Year, (Don’t Sweat It Media, Inc.), founder of Princess Ivana — The Modern Princess at www.princessivana.com, and a featured blogger on Modern Mom. Although she’s a princess, Ivana didn’t wait for a kiss to save her; using her master’s degree in education, she forged a career of her own as a digital strategy consultant. Ivana and her Prince Charming have two fabulous kids.